The government, which funds Intercités trains, will launch a tender to operate from 2022 lines Nantes-Lyon and Nantes-Bordeaux that operates today the SNCF. The state wants to serve as an example for the regions to also call for tenders on their TER. As station manager of a dozen or so Intercités lines, the government whistled the departure of rail competition in passenger transport. 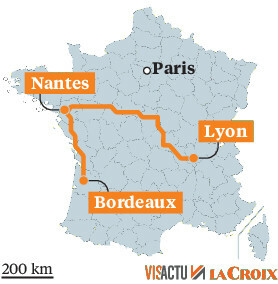 The Ministry of Transport announced on January 9 that it will publish in the coming days a "Pre-information notice for the competition between the Nantes-Bordeaux and Nantes-Lyon Intercity lines" the Official newspaper. The call for tenders will be launched in 12 months. These two lines will be assigned to a single operator. The Nantes-Bordeaux line now transports 686,000 passengers each year with three daily return trips, while Nantes-Lyon drains 387,000 passengers with two return trips a day. The two together cost 25 million euros of public subsidies. The government did not want to open at once to the competition all the Intercités lines of which it finances the exploitation by the SNCF. It has chosen, according to the Ministry of Transport, two lines whose rolling stock has been renewed. "Their competition therefore comes in a coherent way as a new stage of their lives opens"says a statement. If the State finances the exploitation of the Intercités by subsidies to their operator, it also owns the trains. The operator chosen after the call for tenders will be entrusted with them. This is also the case with TERs that belong to the regions. This makes many observers say that competition will be mainly in France on these subsidized networks. High speed, which does not involve any public support, supposes already having dedicated trains or capital to invest in such expensive equipment. Who to challenge the SNCF? But the SNCF is not said to be ready to let it go. "These are two beautiful public service lines, Railway President Guillaume Pepy said on 9 January on the occasion of greetings to the press. We will fight to win. "And this even if some observers believe that these two lines cost more to the SNCF than the amount of subsidies. "In a year, the State will make known its specifications including the number of trains he wants and at what time, explains for its part a manager of the SNCF. The operators will then have to estimate the costs but also the possible receipts. The risk for an operator would be to underestimate the revenue or the costs go down. " But if the government hopes that costs, and therefore its subsidy, will fall, it also counts on improved quality of service. In any event, the next operator of these two lines will not take control until at least 2022. The period following the call for tenders itself should last at least one year before the final choice, period followed probably a year of preparation. Seven months after the rail reform act, the government is primarily trying to trigger the competition process in the regions. "We realize that the regions, despite the reproaches they show towards the SNCF, are actually more than lukewarm to take the step, says Yves Crozet, emeritus professor at the Development, Economy and Transport Laboratory of the University of Lyon. Local authorities fear the social risk because it should not be forgotten that entrusting their lines to a private operator also involves the transfer of SNCF staff to the latter. " On Thursday, January 10, the South-Rail trade union also denounced a "Annexation of the public good, railway workers trained and farm subsidies by large private groups".